Low Back Disorders, Third Edition With Web Resource, guides readers through the assessment and treatment of low back pain, providing evidence-based research on the best methods of rehabilitation and prevention of future injury. 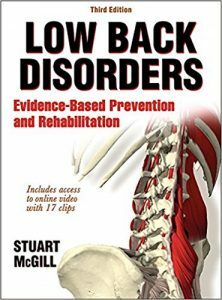 In this book, internationally recognized low back specialist Stuart McGill presents the research and applications of back anatomy and biomechanics to build effective prevention and rehabilitation programs for patients or clients. This third edition of Low Back Disorders contains all of the essential tools for those with low back maladies. Strong foundational information on anatomy and injury mechanisms guide readers through the essential functions of the structures of the low back and related tissues, and common misconceptions about pain and discomfort are addressed and corrected. The text provides detailed insights into injury assessment by an extensively expanded set of tests with accompanying instructions. These provide guidance and recommendations for individualized rehabilitation strategies and exercises. Also new to this edition is a web resource featuring 20 fillable Handouts for Patients or Clients that can be edited and printed to suit practitioner and patients’ needs. The web resource also contains an online video suite that showcases various exercises and assessments. In addition to offering strategies for relieving and potentially eliminating pain, the text provides insight into the conditions and environments that may initially cause back pain and makes recommendations on reducing these influences so that clients can be pain free. Completely updated information and streamlined chapter organization ensure that practitioners use best clinical practices. Practical checklists throughout the text provide easy access to testing and assessment clinical techniques and information. Practical Applications provide clinical information to aid readers in understanding concepts and theory. To aid instructors, the text includes a newly added image bank to visually support class lectures. Low Back Disorders, Third Edition With Web Resource, contains essential research and corresponding clinical applications in a clear and organized format. Part I introduces the functional anatomy and biomechanics of the lumbar spine. It also presents epidemiological studies on low back disorders and dispels common myths of lumbar spine stability. Part II reviews risk factors for low back disorders and common prevention methods, with specific attention paid to reducing workplace risk factors. Part III explains evaluating and diagnosing clients and developing exercise and rehabilitation programs. Specific exercises that are proven to enhance performance and reduce pain are also explained. Evidence-based research and cutting-edge application strategies from a leading spine specialist in North America make Low Back Disorders, Third Edition With Web Resource, the authoritative text for the examination and rehabilitation of the low back. Its approach to back care will lead readers in developing intervention, rehabilitation, and prevention programs to address the unique needs of each patient or client.